Background: Human metapneumovirus (hMPV) is a Paramyxovirus known to cause acute respiratory tract infections in children and young adults. To date, there is no study from the Aseer region of Saudi Arabia determining the proportion and severity of hMPV infection among pediatric hospitalized patients with respiratory infections. Objectives: The objective of this study is to determine the presence of hMPV antigens in the nasopharyngeal secretions of pediatric patients hospitalized with respiratory tract infections in the Aseer region of Saudi Arabia. Materials and Methods: This prospective, serological hospital-based study included all pediatric patients who were admitted to Aseer Central Hospital, Abha, Saudi Arabia, from July 2016 to November 2017 with upper and/or lower respiratory tract infections. Basic demographics of patients and their clinical data on and after admission were recorded. Direct fluorescent antibody assay was used to detect the presence of hMPV antigens in the obtained nasopharyngeal secretion specimens. Results: During the study, 91 pediatric patients were hospitalized due to upper and/or lower respiratory tract infections, of which 9.9% were positive for hMPV. These patients were aged 9 months to 16 years, were from Abha city or its surrounding localities and were mostly (77.8%) hospitalized during autumn or winter. The most common diagnosis on admission was bronchopneumonia (55.5%) and aspiration pneumonia (22.2%), and some patients also had underlying chronic conditions such as chronic heart disease (22.2%) and bronchial asthma (11.1%). Conclusions: The results obtained indicated that hMPV is a potential etiologic factor for the commonly occurring acute respiratory infections in hospitalized children from the Aseer region of Saudi Arabia. hMPV infection was also found to be associated with complicated respiratory conditions such as bronchopneumonia, chronic heart disease and bronchial asthma. Human metapneumovirus (hMPV) is a single-stranded RNA-enveloped virus, recently classified in the order Mononegavirales, family Pneumoviridae, genus Metapneumovirus and species hMPV. It was first isolated in the Netherlands by van den Hoogen et al.,, and is now a known causative agent of upper and lower respiratory tract infections in children and adults. hMPV infections have been reported in Australia, Canada, the United States, the United Kingdom, Hong Kong, South Africa, Mexico, Spain and Peru. However, in the Middle East, there have only been few reports of hMPV infections, mainly as sporadic infections in Egypt, Jordan, Kuwait and Saudi Arabia. Along with respiratory syncytial virus (RSV) infections, hMPV is now recognized as a primary etiologic agent for acute upper and lower respiratory tract infections in pediatrics., In a study from Mexico, it was found that the number of hMPV infections increased in children aged 24–36 months as compared with those in younger age groups, whereas RSV infections were inversely proportional to increase in age. Co-infection with both viruses can also occur, resulting in a more complicated and serious clinical disease., In addition to the pediatric population, studies have also found hMPV to infect adults and elderly people. In terms of transmission, hMPV spreads through contact with contaminated secretions, i.e., droplet, aerosol or fomites. Hospital-acquired hMPV infections have also been reported. In Saudi Arabia, there is a paucity of data regarding the occurrence of hMPV and its role in complicated clinical cases of commonly reported respiratory infections. Therefore, the current study aimed to determine the role of hMPV in the respiratory tract infections' severity and complications among hospitalized children in the Aseer region, where no such study has previously been conducted. This prospective, serological study included pediatric patients who were admitted to Aseer Central Hospital, Abha, Kingdom of Saudi Arabia, from July 2016 to November 2017 with upper and/or lower respiratory tract infections. Aseer Central Hospital is the largest tertiary care referral hospital in the Aseer region, and thus its sample is representative of the area. Data such as age, gender, clinical presentation and current medications were collected using an objectively prepared questionnaire. Informed consent was obtained from the parents/guardians of all patients before sample collection. Nasopharyngeal secretions were collected from all hospitalized patients included in this study using the standard collection method. Briefly, physicians collected the nasopharyngeal secretions with the help of a sterile feeding tube connected to a vacuum pump. Following the vacuum application, the tip of the tube was cut and placed into a sterile container labelled with the patient's name and identification number. The container was then transported to the Virology Laboratory at the Department of Microbiology and Clinical Parasitology, College of Medicine, King Khalid University, Abha, Saudi Arabia, and either processed on the same day or stored at −70°C. Specimens were processed according to the manufacturer's instructions for the direct fluorescent antibody (DFA) kit (Oxoid Ltd., Cambridge, UK) with minor modifications. Samples were transferred to an Eppendorf tube containing 1 mL of phosphate–buffered saline (PBS; pH 7.5). The specimens were gently vortexed for 30 s to reduce the viscosity and dilute the mucus. Samples were then centrifuged at 3000 rpm for 5 min to separate the cells from the mucus. The supernatant was removed, and the cells in the pellets were used for DFA staining. The authors chose to use DFA because it has been found to be a useful technique for wider hMPV epidemiological studies. The cell suspension was washed several times with PBS and the final cell deposit was resuspended in 2 mL PBS (pH 7.5). The cells were then gently agitated by pipetting up and down until the cellular material was released from the mucus. Additional PBS was added until a smooth suspension was obtained, and any visible flecks of mucus were removed. After the cell separation process was completed, the obtained cell suspension was centrifuged at room temperature (15°C–30°C) for 10 min at 3500 rpm and the supernatant was discarded. The final cell deposit was resuspended in PBS to dilute any remaining mucus and maintain high cell density. A volume of 25 μl of the resuspended cell deposit was placed in slides with 6-mm-diameter wells. The specimens were then allowed to air dry thoroughly and fixed with fresh acetone at room temperature (15°C–30°C) for 10 min. The slide was air-dried after fixation. A volume of 25 μl of IMAGEN™ hMPV reagent (Oxoid Ltd., Cambridge, UK), which contains monoclonal antibodies against hMPV conjugated to fluorescein isothiocyanate, was added to the fixed cell preparation on the slide to cover the wells. The same amount was also added to the positive control slide. The slides were then incubated with the reagent in a moist chamber for 15 min at 37°C. Following incubation, excess reagent was washed off with PBS, and the slide was gently washed in an agitating bath containing PBS for 5 min. The PBS was drained off, and slide was allowed to air dry at room temperature (15°C–30°C). One drop of IMAGEN™ hMPV mounting fluid was added to the center of each well, and cover-slip was placed over the mounting fluid and specimen to ensure that there are no trapped air bubbles. 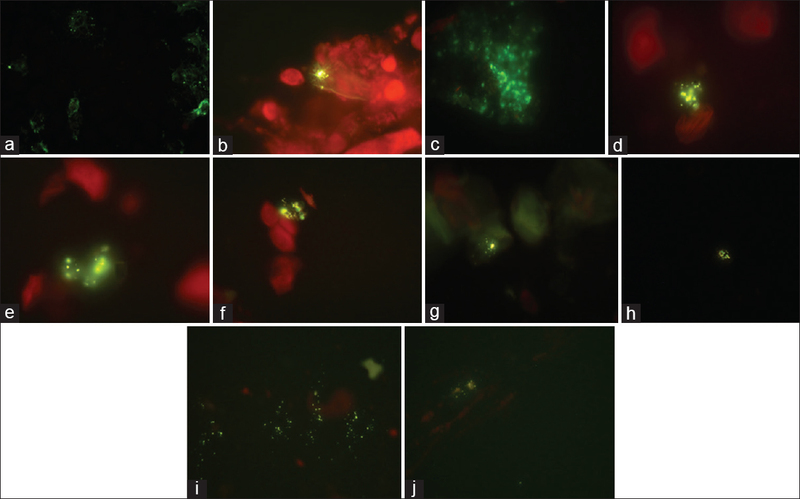 The stained slides were immediately examined under epifluorescence microscope at ×400 and then ×1000. Apple-green fluorescence was observed in the cells infected with hMPV, whereas non-infected cells appeared as red color because they were stained with the Evans blue More Details counterstain. Images of these cells were captured using a microscopic camera (Nikon-DS-Fi1, Nikon Corp., Tokyo, Japan) and archived. During the study, a total of 91 pediatric patients were hospitalized based on upper and/or lower respiratory tract infections. Of these 9 (9.9%) patients tested positive for hMPV antigens, as demonstrated by DFA from the nasopharyngeal secretions [Figure 1]. [Table 1] provides the demographic and clinical presentation data of all hMPV-positive patients. The age of these patients ranged from 9 months to 16 years and all were Saudi nationals except one infant, who was a Jordanian by nationality but was born and raised in Saudi Arabia. From the patient's demographics, it was observed that hMPV antigens were detected not only in patients from Abha but also among those from its bordering areas, namely, Algahama, Bilahmar, Ahud Rufida, Sarat Abeedah, Khamis Mushait and Bilasmer. Three of the nine positive cases were found from Abha (33.3%), and one positive case from each of the previously mentioned six cities was reported (11.1%). Of the nine hMPV-positive patients, seven (77.8%) were hospitalized during the autumn and winter of 2016–2017. In the hMPV-positive patients, the symptoms included fever (77.8%), cough (77.8), shortness of breath (66.7%), nasal congestion (11.1%), cyanosis (11.1%) and stridor (11.1%). These patients also had underlying chronic illnesses such as chronic heart disease (22.2%) and bronchial asthma (11.1%), and most had tachypnea (88.8%). On physical examinations, bilateral crepitation and wheezing were found to be the major findings along with bronchopneumonia (55.5%) and aspiration pneumonia (22.2%). In Saudi Arabia, although few studies have reported the incidence, epidemiological elements and genetic diversity of hMPV in some regions,,, there are no reports on the association between hMPV infections and the clinical presentations of respiratory tract infections among pediatrics. The current study found that in the Aseer region of Saudi Arabia, about 10% of hospitalization among pediatrics with respiratory tract infections between July 2016 and November 2017 was due to hMPV infections. In addition, this study also found that hMPV infections were associated with presentation of acute respiratory symptoms, thereby highlighting the role of the infection in complicating the course of the disease. The results of the present study concur with several other studies demonstrating an association between hMPV infection and acute respiratory conditions such as bronchopneumonia and pneumonia., A previous study implicated hMPV as a causative agent for severe and acute respiratory infections among pediatric patients, which is similar to the findings of the current study. Another study found that children with hMPV infection are likely to have immunodeficiency; however, the current study was not able to substantiate these findings as none of the patients were found to be immunocompromised. The prevalence of hMPV infection of the current study (about 10%) was similar to that reported in studies from Saudi Arabia and Kuwait., However, other similar studies that used direct immunofluorescence assays for the detection of hMPV antibodies in sera of patients revealed much higher prevalence rates. This suggests that different results can be obtained with different diagnostic techniques for hMPV infection. In the current study, we used DFA with monoclonal antibody, which has previously been shown to have 100% specificity, thereby indicating the reliability of our results. The current study did not find any gender predilection in terms of the infections; these findings are in accordance with that of Bastien et al. and Kahn. The hMPV-positive patients in the current study had fever, cough, nasal congestion, cyanosis, stridor and shortness of breath, while some also had underlying chronic illnesses such as chronic heart disease and bronchial asthma; similar hMPV-associated illnesses were observed in another study. Physical examination revealed wheezing and bilateral crepitation and clinically, the most common presentations were bronchopneumonia and aspiration pneumonia. These findings are in line with those of Williams et al., who found significant association between hMPV and wheezing exacerbations and/or bronchiolitis in infants and young children. In the Aseer region of Saudi Arabia, hMPV was found to be responsible for about one-tenth of hospitalizations in children with acute respiratory tract infections. This study also confirmed that hMPV infection is associated with presentation of acute respiratory symptoms. The authors would like to acknowledge the Deanship of Scientific Research, King Khalid University, Saudi Arabia, for funding this study. They are also extremely grateful to Mr. Riyadh Mousa, Lecturer, Department of Microbiology and Clinical Parasitology, College of Medicine, King Khalid University, for his help in procuring the kits and reagents. This study was funded by the Deanship of Scientific Research, King Khalid University, Saudi Arabia, Research Grant No. 3 (Project No. 190). Rima B, Collins P, Easton A, Fouchier R, Kurath G, Lamb RA, et al. ICTV virus taxonomy profile: Pneumoviridae. J Gen Virol 2017;98:2912-3.
van den Hoogen BG, de Jong JC, Groen J, Kuiken T, de Groot R, Fouchier RA et al. A newly discovered human pneumovirus isolated from young children with respiratory tract disease. Nat Med 2001;7:719- 24. Nissen MD, Siebert DJ, Mackay IM, Sloots TP, Withers SJ. Evidence of Human metapneumovirus in Australian children. Med J 2002;176:188-96. Bastien N, Ward D, Van Caeseele P, Brandt K, Lee HS, McNabb G, et al. Human metapneumovirus infection in the Canadian population. J Clin Microbiol 2003;41:4642–6. Esper F, Boucher D, Weibel C, Martinello RA, Kahn JS. Human metapneumovirus infection in the United States: Clinical manifestations associated with a newly emerging respiratory infection in children. Pediatrics 2003;111:1407-10. Greensill J, McNamara PS, Dove W, Flanagan B, Smyth RL, Hart CA, et al. Human metapneumovirus in severe respiratory syncytial virus bronchiolitis. Emerg Infect Dis 2003;9:372-5. Peiris JS, Tang WH, Chan KH, Khong PL, Guan Y, Lau YL, et al. Children with respiratory disease associated with metapneumovirus in Hong Kong. Emerg Infect Dis 2003;9:628-33. IJpma FF, Beekhuis D, Cotton MF, Pieper CH, Kimpen JL, van den Hoogen BG, et al. Human metapneumovirus infection in hospital referred South African children. J Med Virol 2004;73:486-93. Noyola DE, Alpuche-Solı´s AG, Herrera-Dı´az A, Soria-Guerra RE, Sa´nchez Alvarado J, López-Revilla R, et al. Human metapneumovirus infections in Mexico: Epidemiological and clinical characteristics. J Med Microbiol 2005;54:969-74. García-García ML, Calvo C, Martín F, Pérez-Breña P, Acosta B Casas I, et al. Human metapneumovirus infections in hospitalised infants in Spain. Arch Dis Child 2006;91:290-5. Gray GC, Capuano AW, Setterquist SF, Sanchez JL, Neville JS, Olson J, et al. Human metapneumovirus, Peru. Emerg Infect Dis 2006;12:347-50. El Sayed Zaki M, Raafat D, El-Metaal AA, Ismail M. Study of Human metapneumovirus-associated lower respiratory tract infections in Egyptian adults. Microbiol and Immunol 2009;53:603-8. Ali SA, Williams JV, Chen Q, Faouri S, Shehabi A, Jundi EA, et al. Human metapneumovirus in hospitalized children in Amman. J Med Virol 2010;82:1012-6. Al-Turab M, Chehadeh W, Al-Mulla F, Nakib W. Human matapneumovirus in patients with respiratory tract infection in Kuwait. J Med Virol 2011;83:1811-7. Al Hajjar S, Al Thawadi S, Al Seraihi A, Al Muhsen S, Imambaccus H. Human matapneumovirus and human coronavirus infection and pathogenicity in Saudi Arabia children hospitalized with acute respiratory illness. Ann Saudi Med2011;31:523-7. Pichler K, Assadian O, Berger A. 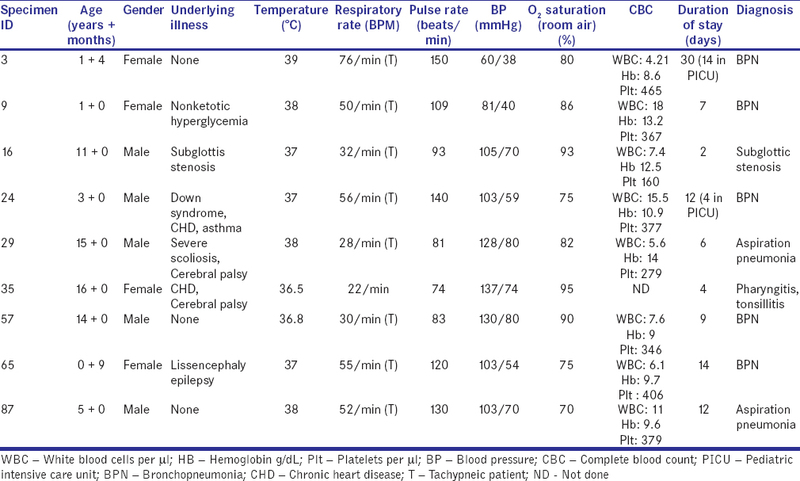 Viral Respiratory Infections in the neonatal intensive care unit-A review. Front Microbiol. 2018;9:2484. Jayaweera JA, Noordeen F, Kothalaweala S, Pitchai FN, Rayes ML. A case series on common cold to severe bronchiolitis and pneumonia in children following Human metapneumovirus infection in Sri Lanka. BMC Res Notes 2018;11:127. Haas LE, Thijsen SFT, van Elden L, Heemstra KA. Human metapneumovirus in adults. Viruses 2013:5;87-110.
van den Hoogen BG. Respiratory tract infection due to Human metapneumovirus among elderly patients. Clin Infect Dis 2007;44:1159-60. Hasvold J, Sjoding M, Pohl K, Cooke C, Hyzy RC. The role of Human metapneumovirus in the critically ill adult patient. J Crit Care 2016;31:233-7. Koo HJ, Lee HN, Choi SH, Sung H, Kim HJ, Do KH, et al. Clinical and radiologic characteristics of Human metapneumovirus infections in adults, South Korea. Emerg Infect Dis 2019;25:15-24. Banerjee S, Sullender WM, Choudekar A, John C, Tyagi V, Fowler K, et al. Detection and genetic diversity of Human metapneumovirus in hospitalized children with acute respiratory infections in India. J Med Virol 2011;83:1799-810. Wadle S, Lehnert M, Rubenwolf S, Zengerle R, von Stetten F. Real-time PCR probe optimization using design of experiments approach. Biomol Detect Quantif 2015;7:1-8. Coyle PV, Ong GM, O'Neill HJ, McCaughey C, De Ornellas D, Mitchell F, et al. A touchdown nucleic acid amplification protocol as an alternative to culture backup for immunofluorescence in the routine diagnosis of acute viral respiratory tract infections. BMC Microbiol 2004;4:1-9. Scheltinga SA, Templeton KE, Beersma MF, Claas EC. Diagnosis of Human metapneumovirus and rhinovirus in patients with respiratory tract infections by an internally controlled multiplex real-time RNA PCR. J Clin Virol 2005;33:306–11. Fenwick F, Young B, McGuckin R, Robinson MJ, Taha Y, Taylor CE, et al. Diagnosis of Human metapneumovirus by immunofluorescence staining with monoclonal antibodies in the North-East of England. J Clin Virol 2007;40:193-6. Kahn JS. Epidemiology of Human metapneumovirus. Clin Microbiol Rev 2006;19: 546-57. Panda S, Mohakud NK, Pena L, Kumar S. Human metapneumovirus: Review of an important respiratory pathogen. Int J Infect Dis 2014;25:45-52. Vinh DC, Newby D, Charest H, McDonald J. Evaluation of a commercial direct fluorescent-antibody assay for Human metapneumovirus in respiratory specimens. J Clinl Microbiol 2008;46:1840-1. Al-Ayed MS, Asaad AM, Qureshi MA, Ameen MS. Viral etiology of respiratory infections in children in southwestern Saudi Arabia using multiplex reverse-transcriptase polymerase chain reaction. Saudi Med J 2014;35:1348-53. Amer HM. Molecular Epidemiology of Human metapneumovirus in Riyadh Province, Saudi Arabia. J Mol Microbiol Biotechnol 2016;26:414-21.
van den Hoogen BG, Osterhaus DM, Fouchier RA. Clinical impact and diagnosis of Human metapneumovirus infection. Pediatr Infect Dis J 2004;23:S25-32. Jun KR, Woo YD, Sung H, Kim MN. Detection of Human metapneumovirus by direct antigen test and shell vial cultures using immunofluorescent antibody staining. J Virol Methods 2008;152:109-11. Gardinassi LG, Marques Simas PV, Salomão JB, Durigon EL, Zanetta Trevisan DM, Corderi JA, et al. Seasonality of viral respiratory infections in Southeast of Brazil: The influence of temperature and air humidity. Braz J Microbiol. 2012;43: 98-108. Ljubin-Sternak S, Milnaric-Galinvic G, Buntic AM, Tabain I, Vilibic-Cavlek T, Cepin-Bogovic J, et al. Seasonal occurrence of Human metapneumovirus infections in Croatia. Pediatr Infect Dis J 2014;33:165-7. Chow WZ, Chan YF, Oong XY, Ng LJ, Nor'E SS, Ng KT, et al. Genetic diversity, seasonality and transmission network of Human metapneumovirus: Identification of a unique sub-lineage of the fusion and attachment genes. Sci Rep 2016;6:27730. Williams JV, Crowe JE, Enriquez R, Minton P, Peebles RS Jr., Hamilton RG, et al. Human metapneumovirus infection plays an etiologic role in acute asthma exacerbations requiring hospitalization in adults. J Infect Dis 2005;192:1149-53. Williams JV, Tollefson SJ, Heymann PW, Carper HT, Patrie J, Crowe JE, et al. Human metapneumovirus infection in children hospitalized for wheezing. J Allergy Clin Immunol 2005;115:1311-2.